The American wigeon (Mareca americana) belongs to the family of ducks and wigeons, the Anatidae. The American wigeon species is distributed in Canada, USA, Mexico, West Indies, Venezuela and Colombia. These wigeon species are migratory and winter in southern regions of North America, West Indies, Venezuela and Colombia. These wigeons are monotypic species. The American wigeon (Mareca americana) is a medium-sized wigeon, measuring 45 to 55 cm in length and weighing 300 to 1100 grams. The wingspan is 75 to 90 cms. The breeding male American wigeon has a greenish mask around its eyes. There is a cream or whitish cap extending up to the bill. The head, nape, face, throat and nape are pale gray with fine dark speckles. The breast, flanks and upper back are chocolate brown. The wings are black and white. There is a large white shoulder patch on each wing. The belly is white. The female has gray and brown plumage. The bill is relatively small, flat and pale blue in color with a black tip. The irises are blackish brown. The legs and feet are pale fleshy gray. The call of the male American wigeon is a whistling "whoee..whoee" sound. The American wigeon species are distributed in Canada, United States, Mexico, West Indies and the northmost parts of South America (Venezuela and Colombia). Vagrant birds have been observed in Iceland, Ireland, Norway, France, Greenland, Sweden, United Kingdom, Belgium, Denmark, Finland, Portugal, Russia, Spain, South Korea, Japan, Taiwan, Morocco and Senegal. The Important Bird and Biodiversity Area (IBA) of the American wigeon species in Mexico is Complejo de Humedales del Noroeste de Chihuahua. The IBAs of these wigeons in Canada are, Long Point Peninsula and Marshes and Fraser River Estuary (Boundary Bay - Roberts Bank - Sturgeon Bank). 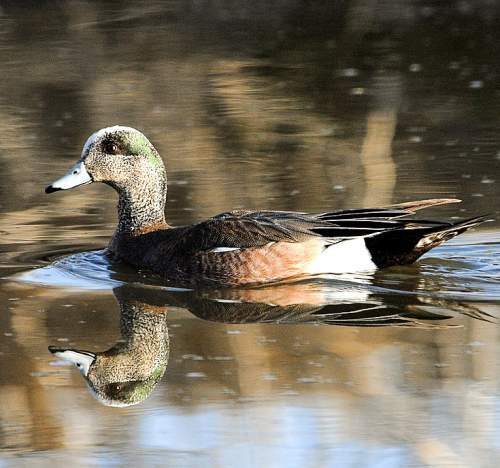 These American wigeon species do not normally occur in forests. They normally occur in altitudes from 0 to 100 meters. The natural ecosystems and habitats of these wigeon species include tropical and subtropical flooded grasslands, coastal lakes, intertidal mud flats, estuaries, tide pools, marshes and freshwater lakes. The diet of these American wigeon species consists mainly of grass. Aquatic plants, grass, sedges, crops and invertebrates like snails, worms, insects and crustaceans are their primary food. 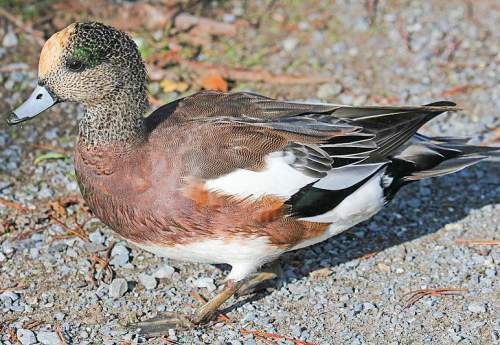 These wigeons dabble for food in water as well as grab pieces of vegetation from diving birds. They graze on pastures and also pick waste grain in harvested fields. The breeding season of the American wigeon species is from April to July. These birds are monogamous and territorial. The breeding sites are located in subarctic boreal forests and wetlands. They nest on ground near water and under vegetative cover. The clutch contains 6 to 12 creamy white eggs. The female American wigeon incubates the eggs for 23-24 days. The males leave the breeding grounds before the hatching of eggs. Soon after hatching, the chicks can swim and feed themselves. The female protects and tends them until they fledge (45 to 60 days). These American wigeon species are partially migratory birds. The populations in Canada and in the higher latitudes of USA are migratory and move to the southern parts of North America, West Indies, Venezuela and Colombia. The populations in west-central United States are breeding residents. Post breeding, the juveniles may disperse and establish in new locations within the range. Within their range they may make local movements for feeding and breeding. The global population size of the American wigeon (Mareca americana) has not been quantified. The overall population trend of the species is considered to be stable. In most of its range, this wigeon species is reported as common. The generation length is 7 years. Its distribution size is about 17,400,000 sq.km. Habitat alteration, fragmentation and destruction, hunting for food, sport-hunting and capture for pet-trade are the main threats that are endangering the survival of these wigeon species. The American wigeon (Mareca americana) does not approach the thresholds for being Vulnerable either under the range size criterion, or under the population trend criterion or under the population size criterion. 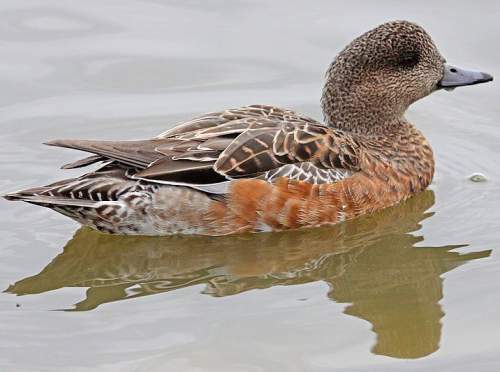 The CITES (Convention on International Trade in Endangered Species of Wild Fauna and Flora) status is ‘Not Evaluated’ for the American wigeon (Mareca americana). The American wigeon (Mareca americana) is closely related to Eurasian wigeon (Mareca penelope) and Chiloé wigeon (Mareca sibilatrix). The American wigeon was earlier placed under the genus Anas. Current topic on American birds: American wigeon - Mareca americana.